On the way home from performing said good deed. OK fine, that’s exactly what happens for a few of our team members every year when we participate in the Volunteers of America Northern Nevada August birthday party. Throwing a party for the families living in the VOA shelter is something local organizations can volunteer to do every month of the year. And it has become one of our most meaningful annual traditions through our yearly good deeds campaign — this year hashtagged with a #24Years24Deeds. We had a whopping 70 children turn out for the festivities. It was heart-warming to see the joy in so many young faces, and simultaneously heart-breaking to realize how many families in our community need help right now. For this month’s party — we got to pick the theme — we turned to one of our favorite inspirational authors. Recognize the rhyming pattern? Or do you need the unhelpful assistance of a certain feline and his tall, stripy hat to help you follow that bouncing ball of clever cadence? Yes, Theodor Geisel, a.k.a. Dr. Seuss, wrote those words, and we couldn’t agree more. With Dr. Seuss as our muse, we had fun with rhymes, themed snacks and cupcakes, Seuss bingo and even make-your-own Fox-in-Sox puppets as we celebrated with the families. Prizes for participants included Dr. Seuss books, bubbles (which are ALWAYS a favorite) and temporary Grinch tattoos. 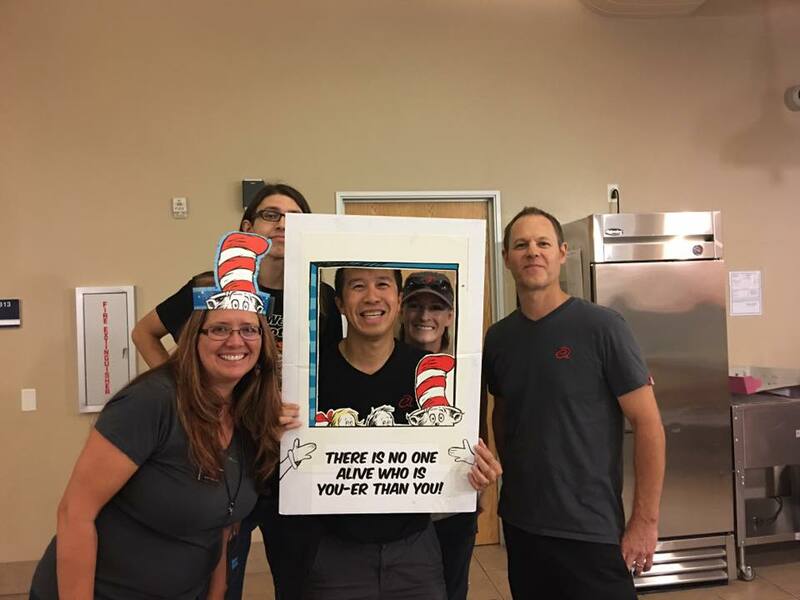 We’re incredibly grateful for the Volunteers of America Northern Nevada shelter. This annual deed allows us some insight into the inner-workings of this 24-hour resource for our region’s homeless, and it underscores the need they have for constant help. And with that in mind: please help please help PLEASE HELP! You can learn more about hosting one of the local VOA’s monthly birthday parties — open to all the shelter's resident children, with gifts provided for those with actual birthdays that month — by clicking here. It’s a life-changing experience. And you know you’re in the mood for a good ugly cry. If you’re interested in the other good deeds we’ve already performed this year, click here to browse the highlights — which include blood-letting for a good cause, using “duty” as double entendre and even some mini golf with major impact. Just because they’re good deeds doesn’t mean they have to be boring, after all. Wanna keep up-to-date on all Team Estipona happenings? Join our monthly newsletter email list!